Service Spotlight: Wire EDM | KLH Industries Inc.
During wire electrical discharge machining (wire EDM), a single-strand of metal wire acts as the tool-electrode. This wire, which is commonly made of brass, creates an intense electrical field that cuts the workpiece without actually touching it. Due to the passage of electric current, material is removed from both the workpiece and the wire. Using a strand of wire as a cutting tool creates a linear line, and therefore wire EDM is commonly used to cut all of the way through a workpiece. Wire EDM is best suited for workpieces that have intricate tolerances, material stress limitations, and/or surface finish requirements. Capable of wire EDM cutting extreme heights and weights, KLH Industries, Inc. has remained on the cutting edge of EDM machining technology for over two decades. Wire machines in the EDM department are capable of machining 47 square inches per hour and working within +/- .0001" tolerances and handling parts up to 5 tons and over 2 ft tall. According to Mitsubishi EDM, one of KLH’s machines is "the tallest work piece capacity of any fully-submerged wire EDM on the market." Submersing a part balances thermal levels within the tank, which allows for reliable accuracy and faster cutting times. KLH's large capacity wire EDM machines are ideal for the type of high-tolerance turbine disks found in the aerospace industry, or large-diameter honeycomb seals found in the automotive sectors. Which, if needed, can also be fully inspected by dimensional CMM inspection. 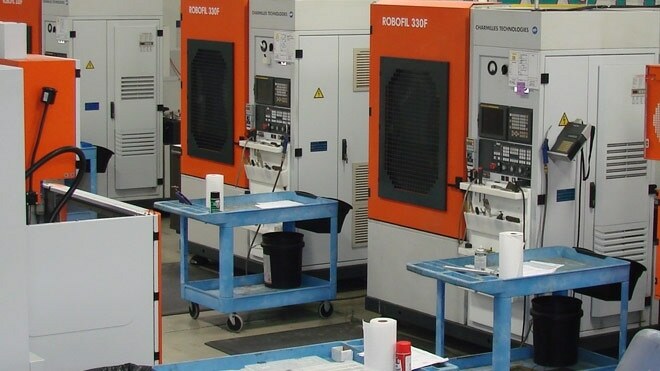 Whether prototypes, one part, or high-production runs, KLH has an EDM machine to match your project requirements. For more information about capabilities or when to use this service, visit wire EDM, or contact the EDM manager.